Looks like a lot of fun and very good quality for the price. Double the fun! 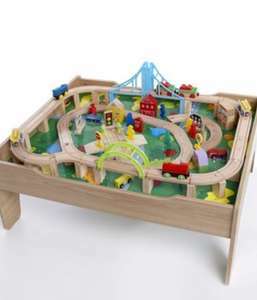 A large train table with a drawer and a 120-piece wooden train set. The train set also features 2 different road scenes that are perfect for fun with cars. Size L77 x W64 x H34cm (30½ x 25¼ x 13½”). Thanks for this! Ordered...although I couldn't pay right away is that normal for this site? Also quid do 7% for new customers. Add code 091 for an extra 20%off and free postage saving almost £15 extra.